"Dear Mrs. Freeman: I am glad to know that you are still happily 'at home.' 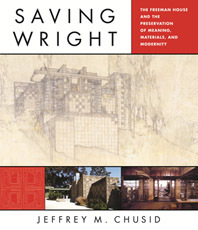 Sincerely, Frank Lloyd Wright." Jeffrey M. Chusid, who lived in the house and studied it while Harriet Freeman was still alive and residing there and, later, after she gave it to the School of Architecture at the University of Southern California, examines the experimental “textile-block” construction system, the power of Wright’s architecture, the interaction of people and place, and the concepts and challenges of historic preservation—why and how we do it. The Freeman House is a valuable case study because it serves as a test of established preservation procedures and protocols, of building forensics and conservation techniques, and of the meaning of a historic site to overlapping and not necessarily compatible communities. 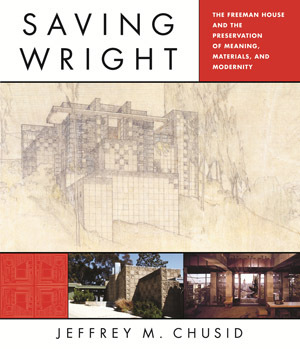 Saving Wright also received an honorable mention for the 2012 Lee Nelson Book Award from the Association for Preservation Technology, Intl. (APT).